Sarah Palin burst on to the US political scene in August 2008, and now she's back alongside Republican frontrunner Donald Trump. Her entry on the national stage came very suddenly, when she was the surprise choice as running mate to Republican presidential candidate Senator John McCain. Until then, the 47-year-old self-described "hockey mom" had only served two years as governor of Alaska. Her previous job was mayor of a small town. By the end of the campaign, Mrs Palin had emerged as one of the Republican Party's most recognisable faces, drawing huge crowds and energising supporters. She returned to Alaska after the election, but in July 2009 surprised many by announcing that she was stepping down as governor two years early. The decision sparked speculation that Mrs Palin was preparing to make a bid for the White House in 2012, but the move never materalised. Since the 2008 election, Mrs Palin has signed a number of lucrative television deals, published two best-selling books, set up a successful fund-raising machine, and championed the grassroots Tea Party movement. In the November 2010 midterm elections, the self-styled "mama grizzly" endorsed more than 60 candidates, about half of whom were elected. Sarah Heath Palin - a former local beauty queen - was born in 1964 in Sandpoint, Idaho. Her family moved to Alaska shortly afterwards to take up teaching positions there. She graduated from the University of Idaho in 1987, having studied journalism and political science. Married for more than 20 years, she gave birth to her fifth child in 2008 - a son who has Down's syndrome. Before being elected Alaska state governor, she served on the city council of Wasilla, which is outside Anchorage, and was its mayor from 1996 to 2002. Mrs Palin is used to breaking new ground. In 2006, she became the first woman and the youngest person to be elected Alaska's state governor. Two years later, when Senator McCain made her his running mate, she became the first woman to sit on the Republican presidential ticket. Her energetic, down-to-earth style - she described herself as "just an average hockey mom" - helped rally support behind him. An opponent of abortion and a life member of the National Rifle Association, Mrs Palin reinvigorated the party's conservative base with a strong performance at the Republican National Convention. But the McCain campaign was soon accused of failing to vet her adequately. The news of her unmarried 17-year-old daughter's pregnancy dominated the opening days of the convention. Mrs Palin was also revealed to be under investigation by state lawmakers over alleged abuse of power. An inquiry by an investigator hired by the Alaskan state legislature determined that she had violated ethics rules by pressing to have her former brother-in-law dismissed. An independent investigator hired by the state personnel board later cleared her. Gaffe-filled interviews were seized on by critics as evidence that she was not up to the job. In one she cited Alaska's proximity to Russia as evidence of her foreign policy credentials; in another she appeared unsure of the vice-president's role. It was all catnip to primetime comedians, and some members of her own party rounded on her. Her rallies, nonetheless, continued to attract large crowds of Republican supporters. In the wake of the presidential election, there were a series of disputes between her and Mr McCain's advisers. Reports emerged that more than $300,000 had been spent on clothes, accessories and stylists for Mrs Palin and her family. Alaskan officials said Mrs Palin owed back-taxes on nearly $18,000 in expenses she had charged the state for living in her home outside Anchorage. She agreed to reimburse the state nearly $7,000 for costs associated with nine trips taken by her children. Mrs Palin also found the state legislature increasingly hostile, and by the time she stepped down as governor no new major bills had been passed in seven months. Opponents had filed several ethics complaints against her. Since stepping down, her political action committee, SarahPAC, has raised hundreds of thousands of dollars. Mrs Palin also has a lucrative career as a public speaker and was paid a $1.25m retainer by the publisher HarperCollins. She became a Fox News contributor - a contract reportedly worth $1m annually - and hosted an eight-part television series called Sarah Palin's Alaska. Her autobiography, Going Rogue, sold nearly three million copies. Her second book, America by Heart, was published in November 2010 and became the fifth best-selling non-fiction book of that year. After a lone gunman shot Democratic Representative Gabrielle Giffords in Tucson, Arizona, in January 2011, Mrs Palin's critics tried to blame her. Her political action committee had drawn cross-hairs on a map to metaphorically target Democratic lawmakers who had voted for President Barack Obama's healthcare bill. Then her "One Nation" bus tour and two trips to the vital caucus state of Iowa in 2011 stoked speculation about possible presidential ambitions, but she declined to run. 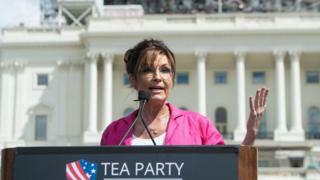 Mrs Palin remains popular with Tea Party activists, but her popularity with rank-and-file Republicans has waned. She launched her own online news network - the Sarah Palin Channel - in 2014, but it was shuttered about a year later. But her comeback to politics was sealed in Iowa when presidential candidate Donald Trump invited her on stage as his high-profile supporter. "Are you ready to stump for Trump?" was her cry to cheering supporters. The way she energised the crowd, dominated the news cycle and dismayed the campaign team of Mr Trump's rival Ted Cruz suggests she has lost none of her political stardust.